SELIGMAN, Ariz. — The Arizona Game and Fish Department is seeking volunteers to assist with fall spotlighting efforts to help document the population of endangered black-footed ferrets in Aubrey Valley and on the Double O Ranch, both near Seligman. As part of the recovery effort, the department has scheduled two five-night spotlighting events – Sept. 7-11 and Oct. 5-9 – and a three-night spotlighting event Nov. 9-11. 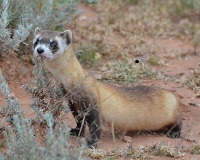 The spotlighting method involves using high-powered lights to locate and identify black-footed ferrets. Their eyeshine is reflected by the spotlight and helps surveyors with identifying and locating these elusive, nocturnal carnivores. Volunteers must have the ability to stay attentive from 8 p.m. to 6 a.m. while spotlighting for black-footed ferrets and use, or learn how to use, a Global Positioning System (GPS). Volunteers can sign up by e-mailing azferret@azgfd.gov — with “fall spotlighting” in the subject line – by Sept. 1 for next month’s project, Sept. 30 for the October event, and Nov. 3 for the November event. Space is limited. These events will be conducted to assess the black-footed ferret population before winter. The objectives include trapping those animals that were not caught in the spring, to trap older ones that need a canine distemper or plague booster, and to trap juveniles (or “kits”) to administer vaccinations.